In a season that has seen numerous records broken, another one was put to bed today; the win record. In thirty years of this wonderful club no one side has won more than 10 games but on July 30th 2017 the record was beaten, albeit in a T20 game because of the impending downpour post 5pm. The lads arrived to a bit of pudding of a pitch, with dessert menus at the ready Rob Hewlitt won the toss and elected to bat first. Andy Gorton and Ian Chuck opened up for the Elf and with strike rates being kept Chuck was eager to please and slapped a six early doors but nicked off to a good catch from the opposing keeper low down to go for 11 off 10 balls. 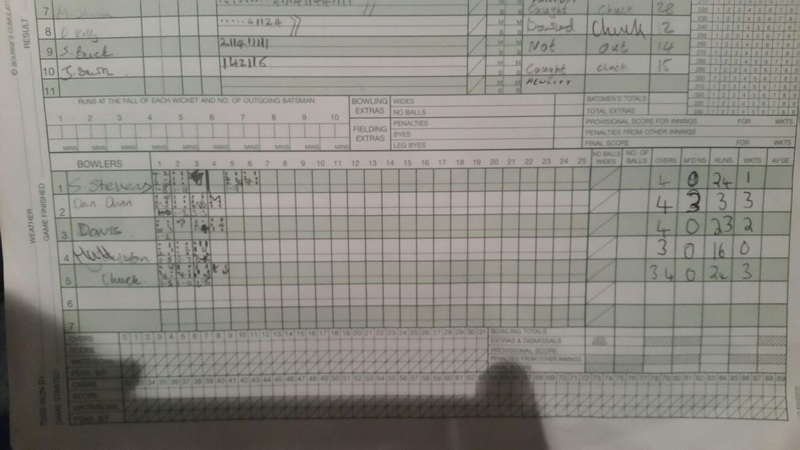 Sam Stephens came out and scored three off three before he was bowled, shortly followed by Gort who was the first man to see his strike rate go sub one hundred when he was sent back for four. The best partnership of the match then took place between Alex Nunns who scored 29 off 19 balls, majoring in boundaries including a big six over square leg. Rob Hewlitt nudged and nurdled his way to 12 off 18 in a disappointing 66.66 strike rate. Greg Phillpott scored 12 which included another monster six to the short boundary but Nicka Dunn was out for two and the Elf were struggling a bit looking to post over 100 for victory. 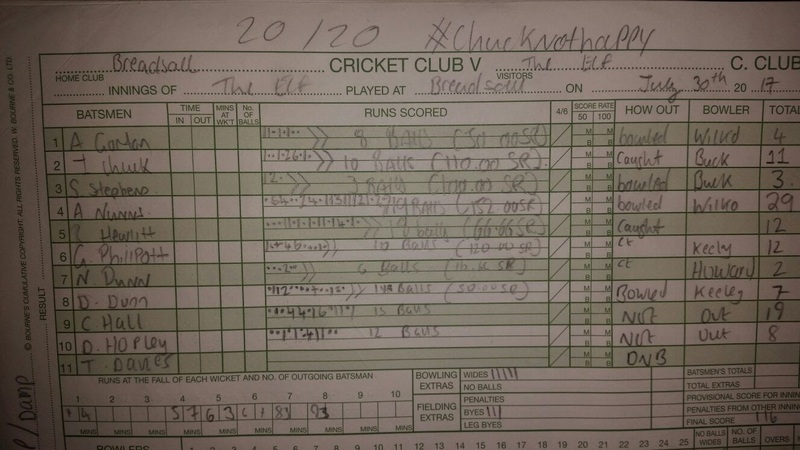 Dan Dunn and Chris Hall added a tidy 26 between them, Chall finishing with 19 off 15 (not out) balls in good partnership with Moto GP’s own Dan Hopley who finished 8 not out to ensure the Elf were not bowled out. The quick change around in between innings was proper T20 style and the wickets came thick and fast. Sam Stephens got Howard in the final ball of the first over after he nicked off to Gort who took a smart one handed grab. Dan Dun then got going, he got the other opener stumped after Gort’s Guillotine was open for business once again. Tom Davies came down the hill and picked up Gilliam after a calm grab by Alex Nunns. The home side were scoring runs but were got stemming the flow of wickets. Dan Dunn got two wickets in a over after Rob Hewlitt took a catch in Dollyland and the very next ball Dunn bowled Wilkinson with a jaffa to finish with unreal figures of 4-3-3-3 to go along with last week’s outstanding figures, Dunn junior is proving his worth to side, still only 15 years old. Davies dismissed ‘Basher’, again a smart grab from Nunns and Breadsall were 6 down for about 40. Davies gave the Breadsall man a bit of a send off after being slapped for 6 first ball, quite village really and had this been an ICC game the man from West Bromwich may have received some points there. A good partnership moved Breadsall towards their target but Chuck picked up Kelly for 12 before Johnson top scored for the side from Derbyshire and then, it happened….the greatest catch you will EVER see on a cricket field. I mean, seriously, you could watch every cricket game from now until the day you die and you’ll never anything like that ever again. Batsman Johnson hit a firm drive in the air towards mid on, the ball was hit quite flat and was in the air for a while but lurking was Greg Phillpott. Now, Greg doesn’t drop a lot of things, especially cricket balls but this ball was by no means straight at him. Greg had to run probably about 10 yards to his right and nonchalantly caught the ball ONE HANDED around waist height. I know I haven’t done the catch anywhere near as much justice as it deserved but anyone who has played the game will know what difficulty level it requires. Absurd! The next wicket was rubbish in comparison, Burn hit Chuck in the air looking for the runs and Rob Hewlitt ran around and took a steepler to secure the record breaking victory for the Elf. Village scenes then happened when the skipper popped a bottle of champagne to celebrate the record breaking victory. Fortunately the weather forecast was correct so the change in format to a T20 to at least get the game in was the correct thing to do. Well, well, well. Best AWAY tea of the season so far by a long way. A variety of sandwhiches, Pringles, sausage rolls, chicken nuggets for the first time this season. An abundance of fruit, as many as four different pizzas and the dessert options were more than what most sides offer in general for tea rather than for pudding. The only reason it doesn’t score a 10 is because there were no Olives. 9.9/10. Sad times this week, the Love Island is closed for the summer as it came to its climax on Monday evening with apparently Kem and Amber winning? What are the lads going to talk about now? Hopefully there will be a new show to keep them busy during the week but Nicka has said his audition for next year was unsuccessful. 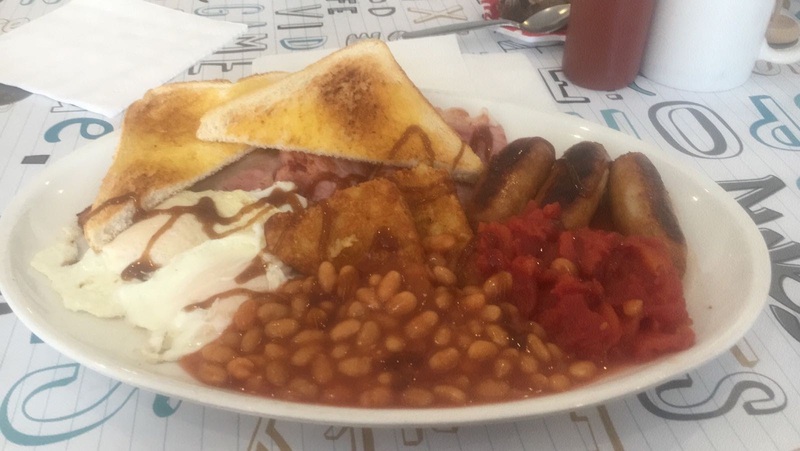 Due to the longevity of the fixture in travel terms, about half the side went over early to ‘Sal’s diner’ (one of Chuckie’s finds) to demolish a breakfast to quash all rumours of PPP. Slightly disappointingly though there was no black pudding on the breakfast. What kind of establishment is this? No black pudding = no breakfast. The sausages were apparently a little on the small side (unlike shower club) and Dan Dunn failed to eat his tomatoes. In other news Chuck seemed to be ‘in there like swimwear’ with the owner, his plate had more food and she apparently was calling him things such a ‘big boy’. More updates to follow in the upcoming weeks on this developing story. Pitiful showers this week, with one shower head having no wall attachment making it a bit DIY. There was a ping pong ball flying around which could have caused damage but the lads were not middling it (like their batting) so there were no tears in the shower. Although Chuck was heard saying “you can’t get your hand around it” when he was showering from behind the curtain, hopefully the man from South Africa was discussing the showering equipment rather than anything else. BIG HILL at Breadsall to get up before you even reach the ground, Ninja Warrior contenders Tom Davies and Chris Hall completed the challenge with cricket bags in tow in record time. As well as this, there was a bit of a slope at one end of the ground but Dan Dunn completed his four overs for almost no runs and three wickets to secure a great time and move to the live semi final. The lads have secured a fixture next week at Rushall so travelator will be back one more time, rumour has it Chall will be driving back and forth to Derby just to take on the Breadsall hill ten times a night in preparation for Rushall.